Over the weekend I created a new smurf account for Heroes of the Storm, “smurf” being an alternate account an experienced MOBA player makes, usually to play with friends who are just starting out in the game. What I found to my unpleasant surprise was a far less enjoyable game than the one I’ve been playing. First there’s the matter of playable characters. Heroes, much like its older competitor League of Legends, is a free-to-play game. The way its monetization scheme works is: the game makes a small batch of its total hero roster available for free; the specific characters on that list alternating every week. You can acquire heroes by either spending real money (usually between $5 and $10 a pop), or grinding through lots of games to earn in-game currency to unlock them. Not having access to the overwhelming majority of playable characters in a MOBA is a crummy issue that prospective League of Legends and Heroes of the Storm players always end up confronting. But there are merits to gating off people’s access to this type of content. Dota 2 lets you play as any of its more than 120 heroes from the outset, which is an overwhelming amount of choice. I don’t think a developer should be expected to release everything they’ve made for free the way Valve does with its MOBA. It’s easy to buy bundles for a game like HOTS or League that will give you a decent selection of characters for $20 to $60, which is still less than the standard retail price of most mainstream big-budget video games that are released today. And if you like a free-to-play game and play it a lot, I feel like you should support the developer monetarily whenever you can. I still think HOTS and League are both too expensive, but that’s a whole other discussion. The real problem with the way Heroes of the Storm introduces new players to the game is that it arbitrarily blocks off your access to some of a hero’s abilities and talents. These are the things you use to upgrade your hero over the course of the game, making them more powerful in a number of different and, ideally, highly customizable ways. As you can see, players can apply upgrades to his ranged spike attack or beef up his shield spell. His other two selections are locked off. You don’t get access to a character’s full range of talents and abilities until you get them to level 5. The game removes this limit once you reach level 25 on your HOTS player profile, but leveling that far also takes a good deal of time. Each hero in HOTS has an individual level in your player profile, meaning that you have to level up every single hero to level 5 in order to acquire the full range of options available to them. Whether you bought a hero or you’re simply using them because they’re on free week doesn’t make a difference here. This limitation drove me crazy once I realized that it gated me off from building Butcher or Zeratul in what I think are clearly the best ways to upgrade them in-game. The Butcher is already a relatively weak character in the current HOTS meta, for instance, and the game itself was making him even weaker by denying me the ability to give him crucial upgrades that boosted his attack speed, damage, and healing abilities. There might be legitimate reasons to gate off players’ progress—particularly for newcomers—in any sort of game. But I think the way Blizzard is handling this in Heroes of the Storm right now is ridiculous. The game is literally denying you access to talents for certain characters that are crucial sources of power for them. Playing with an inferior build—particularly with a low-hitpoint assassin character like Butcher or Zeratul—usually means that you’ll end up dying a whole lot more in a given match. And that just makes the game far less fun than it should. This is the exact same kind of b.s. that Blizzard pulled with Diablo III, a game that almost all seasoned Diablo players agree is way too easy at its starting difficulties, when it forced players to complete the entire campaign once just to be able to unlock higher difficulty levels. One could make an argument that while this type of progress-gating is frustrating, it’s also necessary to help introduce newcomers to complex games. I may not’ve even realized I had a problem with this aspect of HOTS if I didn’t create a smurf account. But when it comes to a MOBA like Heroes of the Storm or League of Legends, blocking off players’ access to vital in-game assets is a really bad way to treat your own audience. It forces new players to grind through far more content than they would otherwise, and that’s just if they decide to stick it out. I’m willing to bet there are many prospective MOBA players who’ve been scared away from the genre, or an individual game, because they don’t believe they have the time to invest in just getting to a point where they can play a game the “right” way. 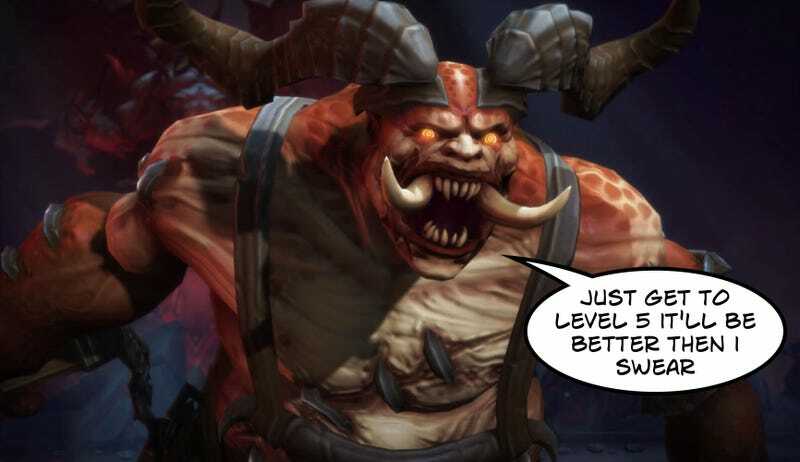 Or more specifically: how many Heroes players might have had a bad first game or several with a character like The Butcher, and never want to play them again? Blizzard has done a lot to position Heroes of the Storm as the “for fun” and “for everyone” MOBA in comparison to grueling and notoriously inaccessible competitors like League of Legends and Dota 2. In many ways, they’ve succeeded in doing so. But if they keep handling newcomers the way they do now, I think they’re going to face bigger and bigger onboarding problems as the game itself continues to expand.